The article provides an overview of the Round table of the expert and analytical working group “Meaning of the victory in the Great Patriotic War for national identity of the people of the euroasian integration countries”. 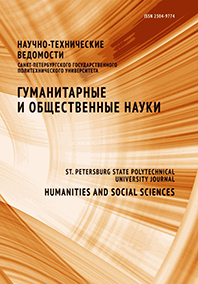 The Round table has been carried out by the Higher school of social sciences, Institute of Humanities of the Peter the Great St. Petersburg Polytechnic University on April 27, 2017 within the “Formation and promotion of the Euroasian integration Ideology on the basis of traditional values, generations succession and preserving the Memory of Victory”. Project organized by Fund of assistance to development of spiritual and moral values “Memory of victories”. In the round table there were discussed such main issues as problems of evolution of a concept of “eurasianism”, mechanisms of formation of national consciousness, international dissociation of the people of the Soviet Union, value for national unity of historical and mythological images in ideological work in days of the Great Patriotic War, reflection of daily occurrence of war in diary entries and letters, values of Russian Orthodox Church in days of the Great Patriotic War, and also values of memory of a victory for youth and preservation of historical memory on the Internet were discussed.